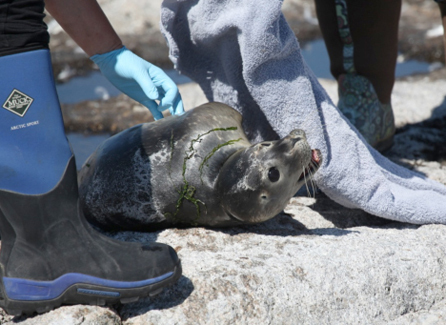 Two Shoals Marine Lab interns, Michelle Moglia ’14 and Laura Bamford ’12, recently had the opportunity to be involved in the rescue of a stranded seal pup on Appledore Island, Isles of Shoals, Maine. Moglia found the seal stranded in a tide pool with a gash in its side, and on July 10 – with help from Marine Mammals of Maine, a nonprofit working with stranded animals – the seal was rescued and taken to the University of New England’s Marine Animal Rehabilitation Center. Photo: Shoals intern Christine Ford.